This collection includes several hundred pieces of English and American glass, including examples from the Warwick, Massachusetts, Glass Factory. English mold-blown olive-amber or so-called "black" glass wine bottle decorated with a seal or glob of glass on side impressed with the stamp, "S / Colton / 1767." The bottle has straight sides and has been finished out of the mold by inflating and tooling; an elongated neck and applied string of glass to form the finish or rim of the bottle; a high kick to the base of the bottle; and a large pontil mark. 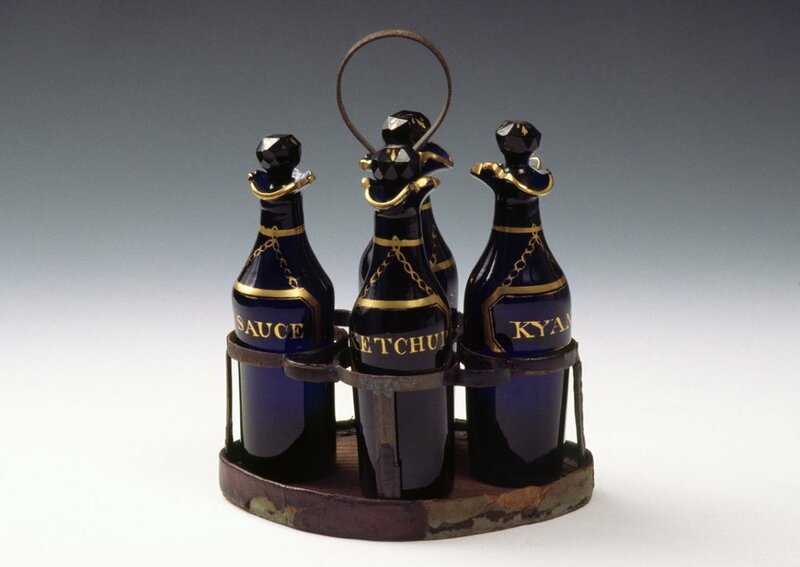 The bottle was made for Longmeadow, Massachusetts, merchant Samuel Colton (1727-1784) who was one of the Valley's most successful and influential merchants. Amethyst lead glass, c. 1845-1865, pressed tulip form vase with a bell-shaped body with scalloped rim, which was one of a pair. There are eight panels on a short cylinder over a joining wafer and octagonal pedestal foot. Possibly made at the Boston and Sandwich Glass Works, Sandwich, MA, similar in form and decoration to examples in Raymond Barlow and Joan Kaiser's The Glass Industry in Sandwich, #3021 Type b.